The Exclusive Group of Hotels and Venues Head Office Pennyhill Park Hotel and Spa, can be found within 123 acres of magnificent Surrey parkland. An elegant country house coupled with the best UK spa complex and Double Michelin star dining, make it one of the regions most sought after destinations for an afternoon tea, a relaxing break, fine dining or even a business conference. Following the giant Redwood Firs along the main entrance driveway and looking left the hotels latest expansion can be seen, the new training home and facilities for the England RFU team with full sized training pitch and gym. With all these options and diverse business model Pennyhill is always a hive of activity. Believing in local sourcing and the issues that transportation has on the environment, the site has created a huge 2 acre fruit and vegetable garden, they also have their own beekeeper and bees providing a saleable and useable product throughout the group of hotels. Pigs are kept by the hotel group at Lainston Manor and the Pennyhill site has its own bakery, opening at 5am to create everything from fresh, from croissants to cakes. With any large business that caters for many hundreds of guests comes waste. Waste arises in higher volumes particularly if your site is equipped with fine dining, where only a tiny proportion of foods being bought in pre-prepared, means that every sprout, every parsnip, swede, carrot, potato, salmon, lamb and beef joint need trimming and preparing. The site having two luxury restaurants served by one huge main kitchen, a large spa eatery with its own kitchen complex, a separate on site bakery that makes fresh breads daily for the whole group of hotels – means a significant amount of food waste is created. Couple this with every conference tables used water bottles, the vegetable boxes, dinner wine bottles, champagne corks, cereal boxes, paint can, broken chair, light bulb, 40,000 pairs of used spa slippers and bottled isotonic supplement for the odd rugby player, then the issue of waste becomes more. It becomes a problem. The site already separate glass and cardboard, hard plastics and recyclable furniture, but food wastes along with general wastes are residing in the compactor and becoming a more and more expensive problem. The sister site to Pennyhill, the Michelin starred South Lodge in Horsham have been recycling food wastes on site with equipment supplied by Tidy Planet for over three years, Exclusive chose again to look to Tidy Planet for their advice on how the wastes could be dealt with more effectively, based on previous success. Tidy Planet this time partnered with MITIE Waste and Environmental and implemented a complete waste management change for the site that started at the very end of 2014, to allow the new year of 2015 to start with a completely fresh approach. 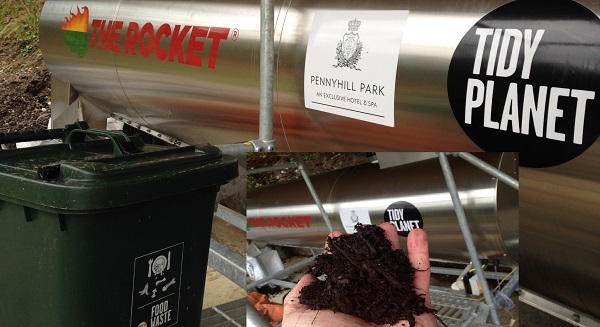 Pennyhill have done away with their general waste compactor, created two new recycling compounds, a dedicated food waste composting area and with comprehensive training and new equipment, have dramatically increased their recycling rates overnight. The food wastes are now segregated at source, collected and brought to two main points, one in the spa kitchen and one in the huge main kitchen. Between both kitchens nearly 6 cubic meters of food waste per week are processed through 2 newly installed Dehydra food waste dewatering systems. The Dehydra dewaterers reduce the volume and free liquid content of the wastes, making them more manageable for moving to the next stage of the process, on site in vessel composting. The wastes are collected from the kitchens three times a day by Pennyhills grounds and gardens team and taken to a newly created composting tier in the 2 acre kitchen garden. Half way along the tier is the new home for two of Tidy Planets A900 Rocket in vessel composters. The Rocket composting systems already in use at their sister site, will be used to compost the dewatered food wastes along with chipped wood from fallen trees from the extensive sites grounds. The structure that the Rocket Composters are housed in is just a shell at the moment, but the gradual build of the structure will incorporate items from the Hotel that are unwanted or recyclable, glass partition doors from the spa, timbers from an old fireplace and a glass bottle wall are all planned for use in making the structure a visual example to Pennyhills guests, of the recycling efforts going on behind the scenes. Inside the novel structure the twin Rocket composters will provide Exclusive Hotels with a continual method of food waste disposal along with a ready supply of peat free compost for use in the grounds and gardens.